Since we get a fair number of submissions that don’t fall into an upcoming theme, I thought I’d give some tips for writing unsolicited general articles for Friends Journal. Length: Articles should run between around 1200 and 2500 words. We can sometimes adapt shorter pieces for our Viewpoint column and longer pieces can be edited down, but it’s never a good sign when something comes to us that so obviously doesn’t fit our format. Previous publication: Submissions should not have been published elsewhere. We don’t want readers opening our magazine and realizing halfway through that they’ve already read the piece. This includes publication in online forums including personal blogs. We realize ideas sometimes get a first threshing in blog posts but successful articles are almost always written from scratch with print publication in mind. 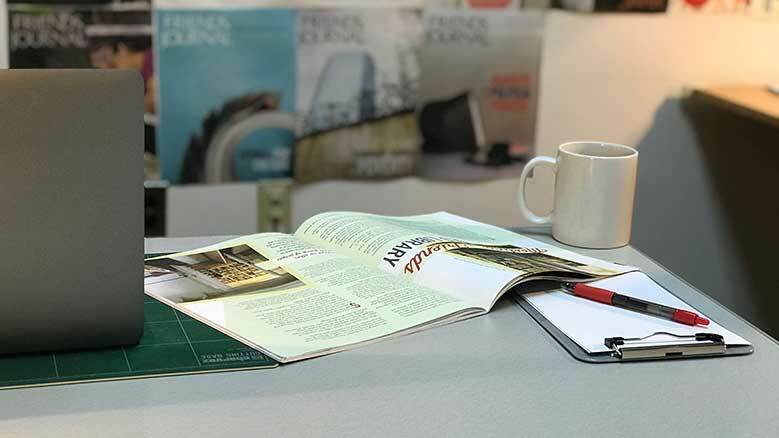 The next thing to ask when writing or pitching an article to us is “why Friends Journal?” There are very few places where someone can write on the Quaker experience and see their work published. This scarcity weighs on us as we select an open issue’s mix. Authors don’t need to be Quaker but the piece should have a strong Quaker hook. I’m not above doing a control‐F on a submission to see how many times “Quaker” or “Friends” is mentioned. If it’s just a tacked‐on reference because you’re shopping a piece written for another publication, it probably won’t work for us. When you’re ready to send us something, please use the Submittable service so that we will have all of your information on file. “General Submissions” is the category for material that we consider for non‐themed issues. Do be aware that we only select for these issues twice a year and that our editorial response time is consequently longer for these.